A sweet elderly woman was visiting from Florida. She’d been all around the U.S. doing genealogy research and finally made it here to use the Allen County Public Library, home of the largest public genealogy archive in the country. She had had a lovely time here and, before she left, really wanted to take some pictures of the Cathedral of the Immaculate Conception but thought she couldn’t because her iPad didn’t have a wireless connection. Part of my day job, coincidentally, is iPad support, so I was able to show her how to use her iPad’s camera (no internet connection required). A couple from Michigan was vacationing here for the weekend. When asked why they decided to come to Fort Wayne, they told us they put several potential destinations in a hat (Cleveland, Chicago, and Indianapolis among them) and drew Fort Wayne. They seemed to really be enjoying their stay. A family in town for the convention of the Macedonian Patriotic Organization of the United States and Canada asked where to find the best seafood in town. Easy: Paula’s on Main and the Oyster Bar. A gentleman from Illinois in town for a sporting event visited twice that day: the first time to get directions to the University of Saint Francis; the second, to thank us for our earlier help. We also found him a hotel to spend the night and a great place to see a movie, too. 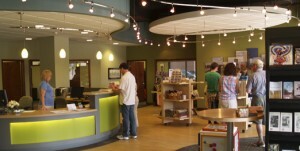 There were also inquiries about relocating to Fort Wayne, good places to play tennis, and what to do when in town for a wedding. There are so many reasons why people come here: sometimes the city is a means to an end (a wedding, a reunion, or a convention), and sometimes the city is an end unto itself (a vacation destination). 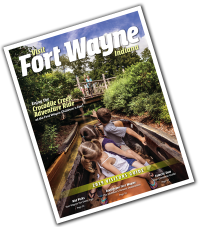 I met both kinds of traveler during my day at the Visitors Center, and I’m looking forward to getting another chance to be on the front line with conventioneers, tourists, and families as they learn how much Fort Wayne has to offer. Until then, they’ll just have to read about it! Apart from spending his college years in West Lafayette, Indiana, and Dayton, Ohio, Mike Flohr is a lifetime resident of the Summit City. Today he divides his time among his wife, Megan, his job as a college librarian, and his many geek obsessions.